The seaside resort of Cowes is the main settlement on Phillip Island. Phillip Island is situated at the entrance to Western Port Bay, south-east of Melbourne. The town is located on the northern coast of the island, at a locality previously known as Mussel Rocks. The island had been leased as a pastoral run but in 1868 a large part was subdivided for closer settlement. The township was surveyed at this time. It was named by Cox, the Government Surveyor, after the port on the Isle of Wight, England. Two hotels were soon constructed, the Isle of Wight and Wood's Family Hotel, both c1870. A jetty was built in 1870 and a ferry service operated from Stony Point on the Mornington Peninsula, the western side of Western Port Bay. Many visitors came to Cowes, attracted by the moderate climate and the opportunity for sea bathing, fishing and shooting. Game animals had earlier been released by the Acclimatisation Society. By the 1920s many large homes were operating as guesthouses. A history of the guest houses at Cowes enumerates thirty at various times. Both hotels were destroyed by fire during this period. The Isle of Wight, burnt in 1925, was rebuilt. Wood's was burnt down in 1920 and was replaced by a new building named Phillip Island Hotel. This also burnt down in the early 1960s. The Victorian municipal directory described the resort in 1938 but omitted mention of the bush nursing hospital. 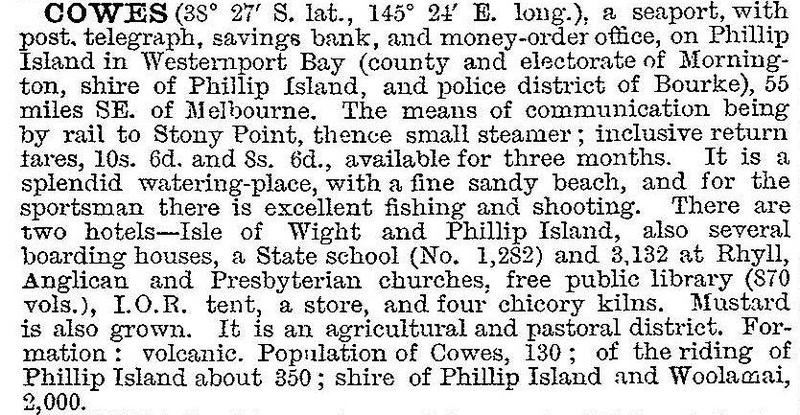 Phillip Island had a substantial farm community, as well as visitors to Cowes. The absence of a hospital had been keenly felt and, with financial assistance from the Victorian Bush Nursing Association, Warley hospital was opened in 1923. By the 1950s the guesthouse trade was in decline. The construction of a bridge to the mainland in 1940 made the island more accessible to the increasing number of car owners. Holiday houses were built on many housing estates developed over the next 30 years. Now numerous motels, flats and caravan parks also cater to the many tourists. The town is also popular as a place of retirement. Although dependent on tourism, Cowes has many services and a large resident population. There are about ten caravan parks, a retirement village, a large Returned Servicemens’ League venue, Anglican (1870), Baptist, Catholic (1938) and Uniting (former Presbyterian, 1895) churches, bowls and golf venues and a busy main street shopping area along Thompson Avenue which is lined with mature cypress trees. Cowes’ built-up area runs the full length of its sheltered beach, from Ventnor to Rhyll. The eastern (Rhyll) end includes the Silverleaves subdivision (250 lots, 1955-62), which is a separate suburb. The State primary school (1874) had an enrolment of 512 in 2014. Secondary schooling is at Wonthaggi, as is hospital care since Warley hospital closed in 2008. The Isle of Wight hotel again fell victim to fire in 2010. The Phillip Island Progress Association began agitation for de-amalgamation from Bass Coast Shire in 2014. At the 2011 census the median age of residents was 51 years (Australia, 37). On census night 38.3% of dwellings were occupied, indicating that over half of them were holiday apartments or houses.